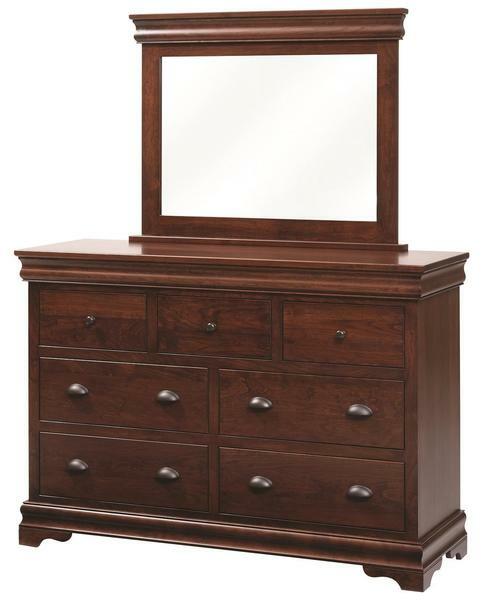 Get the most out of your bedroom set by filling that empty wall space with our Amish Luxembourg Dresser with Optional Mirror! This traditional dresser displays simple lines and a clean design that can't be beat. Imagine getting ready for work each morning, knowing that all you could possibly need is stored safely for you in this authentic Shaker dresser. Our Luxembourg Amish made Dresser will give you peace of mind by knowing all of your clothing is stored away in a safe and sturdy dresser. With plenty of storage space provided by its many drawers, this handcrafted, solid wood dresser can house any number of bedroom necessities! Pair this stunning dresser with our matching Amish Luxembourg Armoire for a unique look and all the storage you can imagine! For a tall, sleek look that's built to match, consider our Amish Luxembourg Chest of Drawers!